There are a number of benefits to LASIK surgery. Clearer vision, a self-confidence boost and not having to rely on glasses or contacts are just a few reasons why many Austin eye patients come to our expert eye surgeons for LASIK surgery. Despite these benefits, many patients may be reluctant or hesitant to go through with the procedure because of costs, opting to rely on contacts instead. But the truth is, LASIK eye surgery can help you save thousands of dollars in vision-related costs over the years. Here’s how. The cost of contacts varies depending on the type. 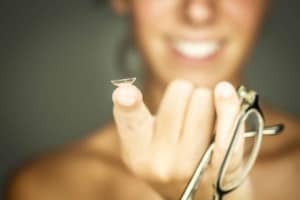 If you replace your contacts approximately every two weeks (as recommended by our eye doctors), you will need about five boxes of lenses per eye, or a total of 10 boxes per year. This totals to approximately $220 to $260 per year. For daily disposable contacts (designed to be discarded after a single use), your annual cost could come out to $480 to $720. Contact lenses designed to correct astigmatism typically cost more, roughly $500 to $700 a year. In addition to these costs, there are maintenance costs to consider. Special cleaning supplies and contact solution can also be pricey; wearing and caring for your contacts may cost you thousands of dollars over your lifetime. It’s important to understand that there is no clear-cut price estimate for LASIK surgery. Ultimately, the cost will depend on several factors, including the technology your surgeon uses, how much vision correction you need and the difficulty of your procedure. On average, LASIK surgery can range from $1,000 to $4,000 per eye. Despite the larger upfront cost, many of our patients find the lifestyle benefits of LASIK make the procedure well worth the investment. When performed by a highly experienced LASIK surgeon like the eye doctors at Austin Eye, LASIK surgery provides excellent results that last for years, and saves you money in the long run. The eye doctors at Austin Eye believe clear vision should never be compromised, which is why they offer several payment options to finance your LASIK surgery. One payment option is CareCredit, which allows patients to make affordable monthly payments. Speak to a member of our team today to learn more about your financing options. Interested in learning more about the benefits of LASIK surgery, or the procedure itself? Schedule an appointment with Austin Eye today. Please call our North office at (512) 250-2020 or our Central office at (512) 454-2020, and a member of our expert team will gladly speak with you.